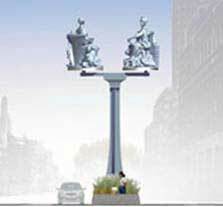 Meet the misses: Artist Brian Tolle’s preliminary design for an iconic “gateway” sculpture at the top of Flatbush Avenue features a Miss Brooklyn and Miss Manhattan statues on a rotating platform. The city also plans extensive plantings. This view shows Flatbush Avenue Extension north of Fulton Street. A larger-than-life sculpture of Miss Brooklyn — joined by her counterpart, Miss Manhattan — will soon perch on a rotating platform high above Flatbush Avenue as part of a redesign of the so-called Gateway to the Borough. The women will shimmy more than 25 feet above the Flatbush Avenue Extension median just south of Tillary Street on a blue metal column modeled after the Neo-Gothic steel beams of the Manhattan Bridge, which disgorges the huddled masses into Brooklyn nearby. But the statue is only one element of a $23-million project to redesign the area. “Flatbush Avenue is the gateway into Brooklyn,” said Joe Chan, president of the Downtown Brooklyn Partnership. Yet currently, the “gateway” is more of a chaotic intersection than a grand entrance, complete with traffic congestion, construction and limited space for pedestrians. The reconstruction, slated for completion this fall, will change that. The project stretches a half-mile from Tillary Street to Fulton Street, and will include a central median lined with trees and benches, increased roadway and sidewalk lighting, sewage upgrades and a new traffic light and pedestrian crossing at Johnson Street. Some places will even boast granite curbs and widened sidewalks lined with benches. “All this is going to contribute to a sense of grandeur, and the vision of a borough that cares about itself and is on the move,” said Mike Weiss, executive director of the Metrotech Business Improvement District. Visions of a redesigned Flatbush date back to 2005, when the city allocated $15 million to reconstruct the thoroughfare. At the time, new development projects spurred by Downtown’s rezoning convinced officials that the avenue needed more than freshly paved sidewalks. Six years and another $8 million later - $3.1 million of which came from the federal stimulus package of 2009 - and Flatbush is finally nearing the end of the much-needed makeover. The beacon of the project, literally, will be Tolle’s installation, which is not yet completed, but is already racking up awards, including a design award in 2008 from the Art Commission, the city’s top artistic honor. The sculpture is a twist on the two Daniel Chester French allegorical sculptures of a female “Brooklyn” and “Manhattan” that once flanked a grand, winged entrance on the Manhattan side of the Manhattan Bridge, but were removed in the 1960s to help the movement of cars. The sculptures are now on display at the Brooklyn Museum.